Chris consulted me after meeting a previous patient of mine. 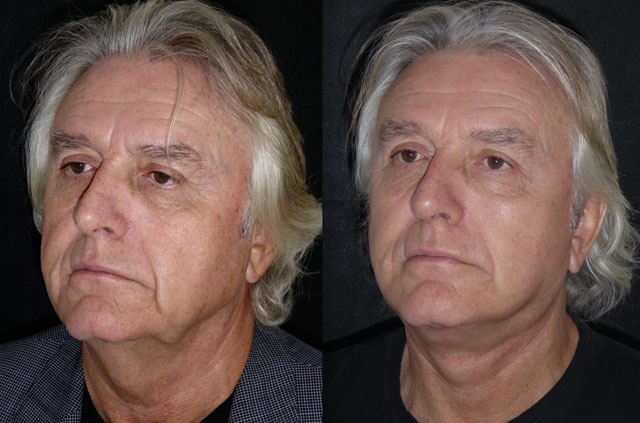 He asked what I would do to freshen his appearance having previously undergone an upper blepharoplasty. He leads an active international life and was looking for a procedure he could fly in - fly out for. 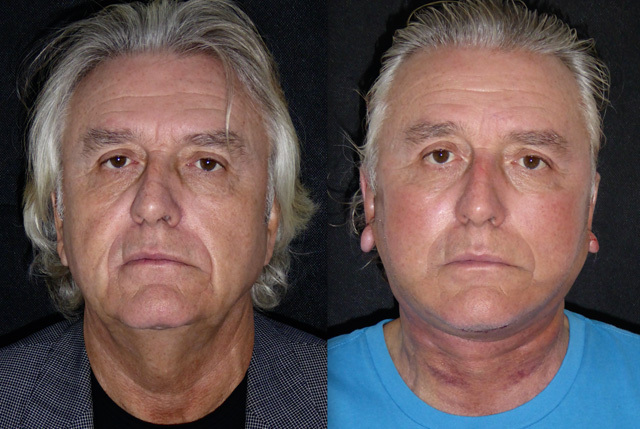 We undertook a face and neck lift, platysmaplasty, underchin and neckline liposuction all under local anaesthetic. 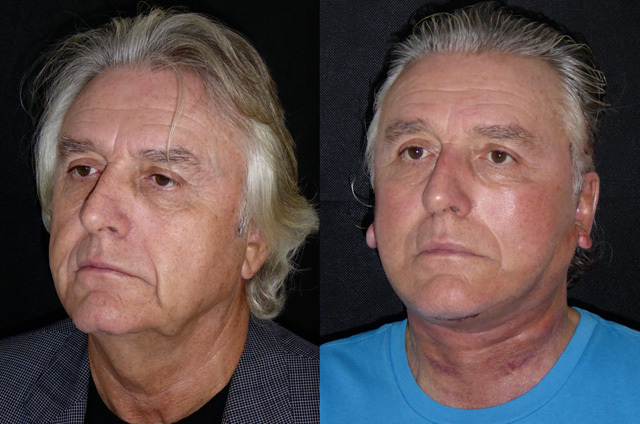 I am seeing an increasing number of men for facial plastic surgery but few consent to sharing of their photo record. My thanks to Chris for allowing his photos to help others. 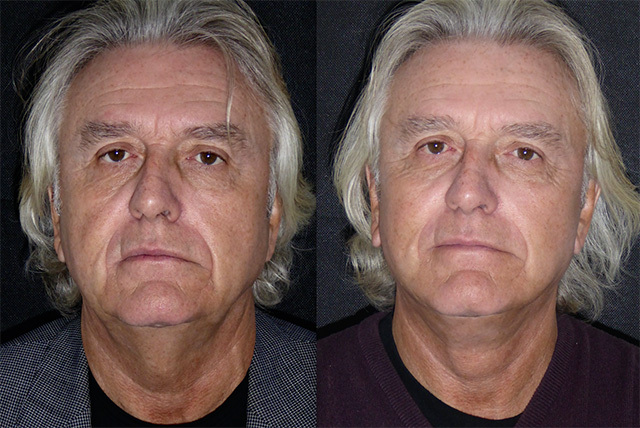 An extensive facial and neck dissection, lift and liposculpture yesterday has already transformed Chris’s face. Only a few hours after surgery he is doing brilliantly, swollen as expected, but is excess midline neck and jowl has gone. With the degree of liposuction (approximately the volume of half a coke can!) 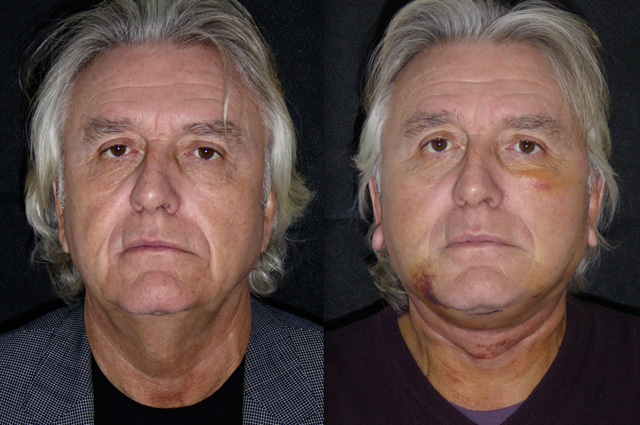 I suspect he will be bruised in a few days but men recover quicker from facial plastic surgery. 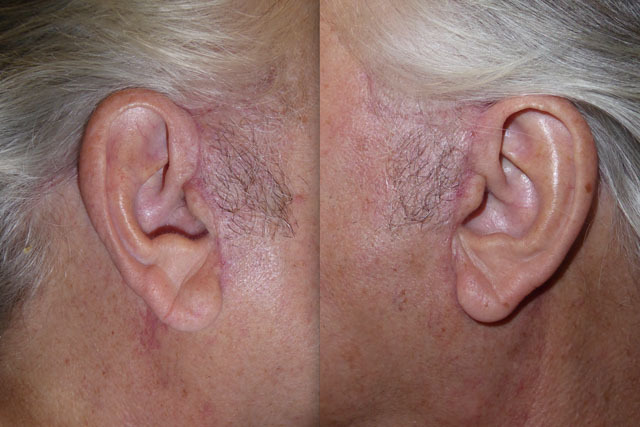 The surgery is trickier as the ligaments connecting the skin to the underlying fascia are stronger but the thicker hair bearing skin has a better blood supply and usually heals super quick. A week later Chris is back for removal of his stitches before flying back to sunnier climes. He looks just great. 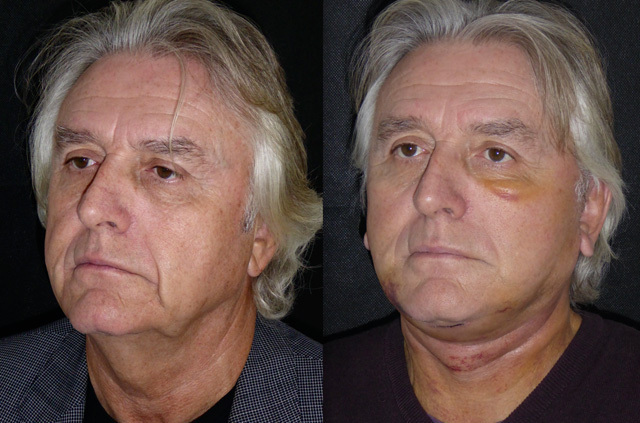 A little bruising in the right jowl and down deep in the neck will fade quickly after I have zapped it with the laser today. 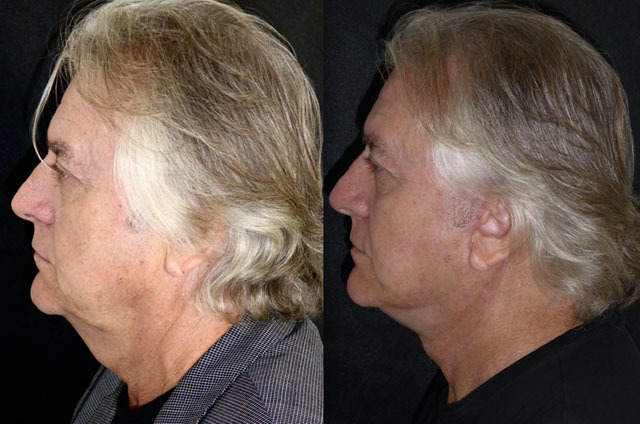 His face shape is hugely improved with good jaw and neckline definition. He will remain swollen under the chin for some weeks as facial lymphatics and fluid pools in this area but this will resolve nicely. His incisions are already healing beautifully and should be inconspicuous in a few weeks. 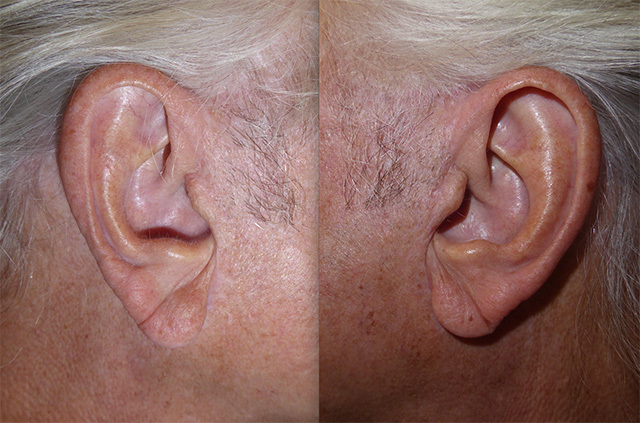 Due to advancement of bearded skin, I recommend guys undergo laser hair removal in front and around the earlobes at 4-6 weeks after surgery. Until then SPF 50+ is really important to protect his scars. 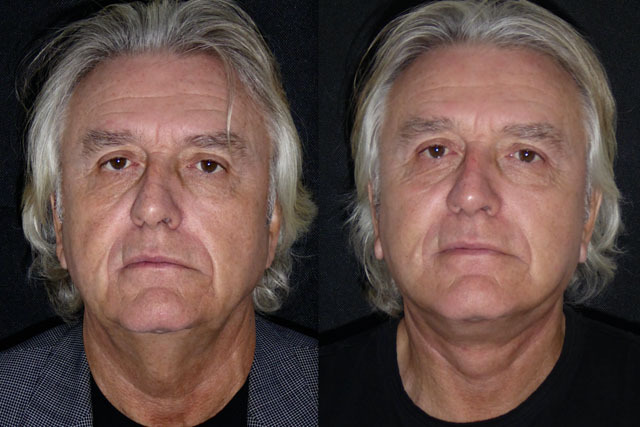 4 weeks out from Face and neck lift, jawline and underchin liposuction and platysmaplasty Chris is back in London for a review. His incisions (see below) are healing beautifully deposit the Barbados sun. 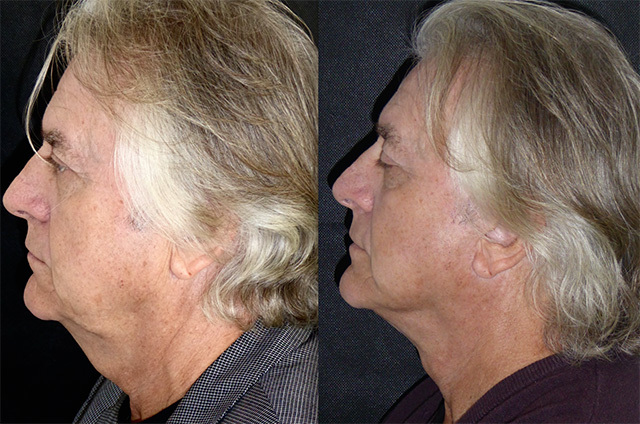 His jaw and neckline contours are much better defined and his jowl is softened. 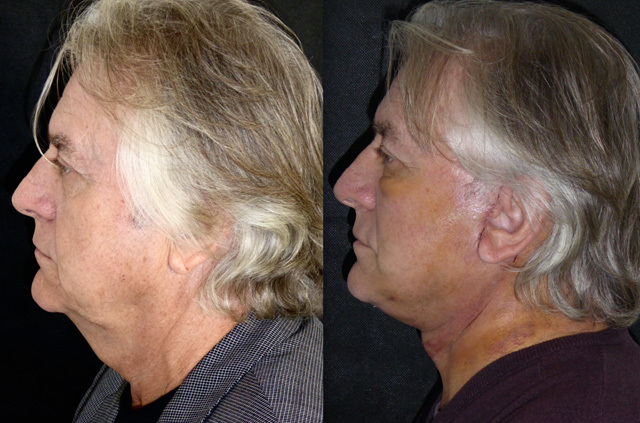 Swelling persists as expected in the neck from a significant amount of liposculpting. A couple of sore nodes tells me that they are working hard to resolve this and all his swelling should be gone at the 3 month review. It’s been a while since I saw Chris last as he is non resident in the UK, whilst passing though London he popped in for a review at 6 months out from surgery. 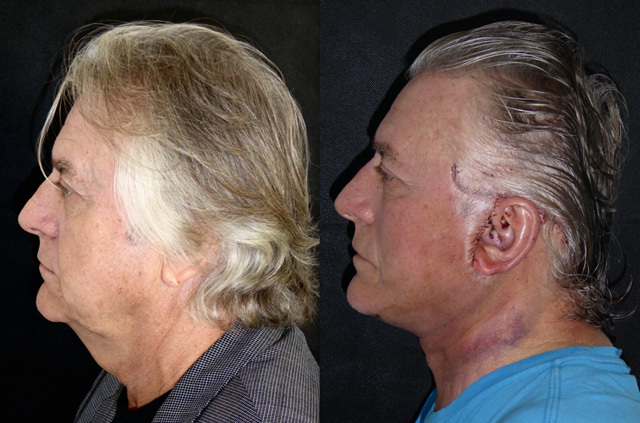 He has continued to heal brilliantly and his scars are now inconspicuous. His lift is holding up really well and Chris looks fresher, well and proportionate. 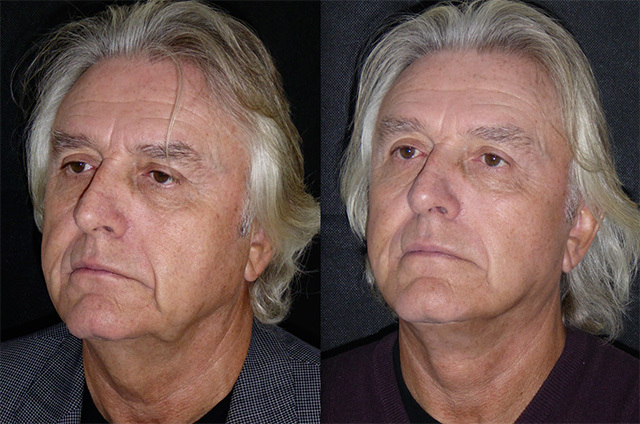 His jaw and neck lines are much cleaner and the volumisation of his mid face has improved the lower eyelid hollowing. Great guy, great result.